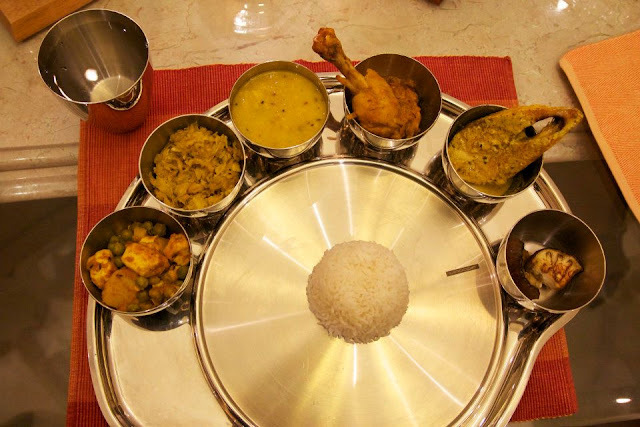 Bou Bhaat is the ceremony in which the bride prepares the traditional Bengali meal and serves it for her in-laws, first time after her wedding. Traditionally observed by the Bengali and Bangladeshi communities. This ritual takes place post wedding. The bride wears a traditional saree gifted to her by her in-laws and the groom wears a suit gifted to him by his in-laws. She prepares the traditional Bengali food comprising of sweets, rice, dal, vegetables, fish, etc. and serves the food to her in-laws and other family members present. After the food is served to her in-laws, the groom offers food to the bride, which is the first meal for her at her new home. In addition, he gifts her a saree as a symbol of his love, care and support for her throughout. This act symbolically gives the message to the bride that the groom will henceforth take the responsibility of her well being and will take care of her food, clothing, shelter, etc. The bride’s parents and close relatives along with the groom’s invitees are a part of this ritual. Bou Bhaat can be closely related to “Mooh Dikhai ki Rasam” which is common in Punjab, UP, Bihar, Jharkhand etc. This ceremony signifies that the bride is now a responsible person who can take care of her family needs. Further, the bride is not allowed to eat in her new house until the Bou Bhaat ceremony is complete. Till then the bride’s food comes from a friend’s or neighbor’s house. So this ceremony marks the beginning for the bride to start her new life ahead in her new home.